CRC is delighted to announce its backing for two Kent community organisations, by sponsoring a youth football team kit and supporting a school's fundraising Golf Day. The company has agreed to a three-year sponsorship deal with the Hartley De Sales Under 15s football team which will include a new kit for 16 players. The football team is based at Hartley Country Club and has just won promotion to Division 2 of the Express Cabs Maidstone Boys Primary League after finishing as runners-up in Division 3. CRC is also supporting a Golf Day organised by the Friends of Wateringbury Primary School to raise funds for resources and equipment for the school in Maidstone. Steve Lawton, CRC's Managing Director, said: "It's a privilege to be able to give something back to the local community by supporting these two organisations. 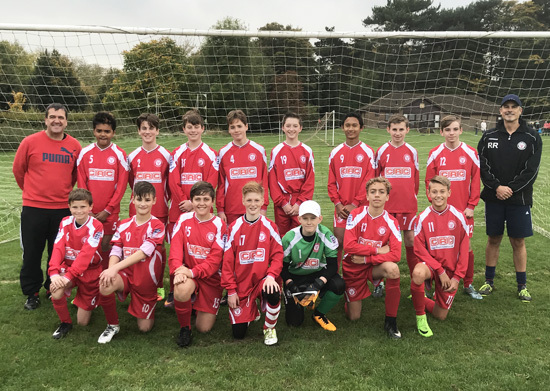 We would like to wish Hartley De Sales Under 15s all the best for the new season in a higher division and we hope that the Golf Day will raise much-needed funds for Wateringbury Primary School." Richard Rowe, team manager for the Under 15s, added: "Investment in grass roots football is vital if young boys and girls are to be given the opportunity to participate in football. Securing this sponsorship from CRC will ensure that Hartley De Sales FC has a new kit for the forthcoming season and beyond, which is great news."